Sony came out swinging earlier than I expected in an issue that I assumed we’d to have to wait until the next console cycle to come to pass. Digital downloads of major retail console video game releases on the same day as their in-store release will be a reality on PSN in October. Not only that, but some of these games even offer a discounted price over their physical counterparts. The biggest questions yet to be answered are how will major retail chains respond and whether Microsoft and its Xbox Live service respond? Since no one has those answers, let’s focus on the games, but not before tipping our cap at PSN for once again raising the expectations of what we should expect for a premium subscription service for game consoles. Big digital games from big publishers on Day 1. It should be noted that there are some rules with this promotion. 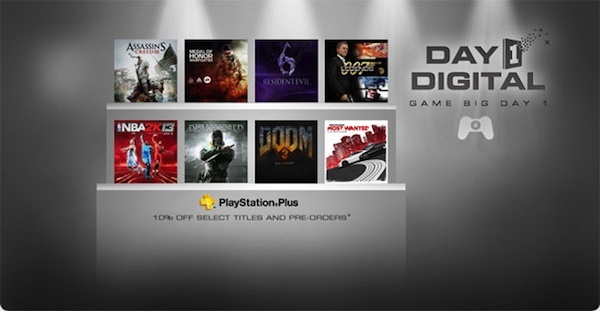 As you can see, some games are not discounted at all and discounts require a PlayStation Plus account AND a pre-order. Games with an asterisk are available for pre-order. The + means that a 10% discount is available for a week after launch for PlayStation Plus subscribers. That’s Capcom, 2K, Bethesda, Activision, EA, and Ubisoft all represented as third party publishers taking part in this promotion. It’s a big win for Sony and for gamers.